Toronto, Canada (June 23, 2015) — All four members of Canada’s recently announced dressage team for the 2015 Pan American Games have something else in common that they can boast about: they are former recipients of the Canadian Dressage Athlete Assistance Program (C-DAAP). Team members Brittany Fraser, Megan Lane, Belinda Trussell and Chris Von Martels all benefited from the funding that C-DAAP provides for the support and advancement of Canada’s high-performance dressage athletes in their pursuit of excellence. The non-profit organization offers 100 percent of its net proceeds from fund-raising events to the riders to offset the cost of training and competing for high performance to compete against the world’s best. In fact, more than $130,000 has been awarded to seven riders since 2012 to help them achieve their goals with another $80,000 slated for distribution this summer. The funding criteria for 2015/2016 have been established with guidelines available at www.cdaap.ca. The deadline for applications is July 31 and recipients will be announced on August 17. For more information about C-DAAP, visit www.cdaap.ca. Check out C-DAAP’s Facebook page at www.facebook.com/CanadianDressageAAP. Chris Von Martels and Zilverstar campaigned in Europe for six months, thanks in part to a $20,000 High Performance European Training and Competition Grant from C-DAAP. Photograph Courtesy of Chris Von Martels. Wellington, Florida – Canadian dressage competitor Chris Von Martels recently returned to North America following six months of training and competing in The Netherlands. As a recipient of a $20,000 High Performance European Training and Competition Grant from the Canadian Dressage Athlete Assistance Program (C-DAAP), Von Martels was able to apply the funding towards his training and competition expenses. While in Europe, Von Martels and his two horses were based at the stables of Tim and Leida Collins in Riethoven, The Netherlands, which was a short drive to his trainer, Sjef Jannsen. He represented Canada in three International Equestrian Federation (FEI) sanctioned competitions in three different countries: CDI3* Compiegne, France; CDI2* Peterhof in Perl, Germany; and CDI3* Zandhoven, Belgium. In addition, he competed at a number of national shows and also showed a horse on behalf of one of his German-based clients at the Trakehner Championships, giving him great exposure to European breed championships. With his top mount, Zilverstar, a 10-year-old Dutch Warmblood gelding, Von Martels ended his European tour on a high note at CDI3* Zandhoven, placing fourth in the Intermediaire I and taking third in the Intermediaire Freestyle with a score of 71.85%. His second mount, Winsor Rox, an 11-year-old black Dutch Warmblood stallion owned by Barbara Nitsch, also gained valuable mileage during their time in Europe. While Von Martels was already planning his six month stay in Europe before learning that he had successfully acquired one of five C-DAAP grants awarded in 2014, the additional funding allowed him to apply a larger amount of funds towards his training, as well as help off-set the costs of boarding, competition, and horse maintenance. Being the recipient of a C-DAAP grant has also strengthened his vision of his long-term goals, both personally as well as for Canadian dressage in general. “My goal is to represent Canada at a major games and, in doing so, to help raise the profile of dressage in Canada,” said Von Martels, 32, who operates Von Martels Dressage Inc. in Ridgetown, ON and Wellington, FL. “Being in Europe, where equestrian sport is much more mainstream than in North America, and being surrounded by the top performing horses and riders in the world, has been incredibly impactful in helping me to achieve these goals. The competitive environment and the quality of horses and riders play on the physical and psychological components of performance. Having this experience has not only advanced my physical skills and the training of the horses, but it has us much better prepared for the pressures and the atmosphere of major international competitions. Von Martels is especially appreciative of the C-DAAP program as it has not only augmented his own training and competition efforts, but also those of his fellow athletes who may one day be riding alongside him as members of the Canadian Dressage Team. “Through the grant program, C-DAAP is giving Canadian dressage riders increased opportunity to gain the experience, training and exposure that is needed to help develop truly competitive horse-rider combinations,” said Von Martels. “If our national goal is to have improved team placings at major games, and to ultimately be on the podium at an Olympics or World Equestrian Games, then we need to be able to provide riders with access to the European environment, and to be amongst the best in the world on a regular basis. The four other Canadian athletes to receive C-DAAP High Performance European Training and Competition Grants in 2014 were Brittany Fraser of New Glasgow, NS and All In, her nine-year-old Dutch Warmblood gelding; Megan Lane of Loretto, ON and Caravella, her 13-year-old Dutch Warmblood mare; Karen Pavicic of Surrey, BC and Don Daiquiri, a 12-year-old Oldenburg gelding owned by Pavicic and Jayne Essig; and Belinda Trussell of Stouffville, ON and Anton, a 14-year-old German-bred gelding owned by Robyn Eames. The Canadian Dressage Athlete Assistance Program (C-DAAP) is a donor-driven program dedicated to supporting and advancing Canada’s junior, young rider and high performance riders. The program solicits contributions and will award grants to eligible Canadian dressage riders. C-DAAP’s goal is to provide supplemental funding to Canadian dressage athletes to off-set training, competitive and educational expenses incurred during their quest for excellence, thus creating a bridge to high-level national and international competition. Left to right: The Countess Bathurst, Commander Chris Hadfield, Deborah Kinzinger Miculinic, Desi Dillingham, Vel Miculinic, Daisy Kinzinger and Frank Kinzinger (seated). Photos by One Shot George. 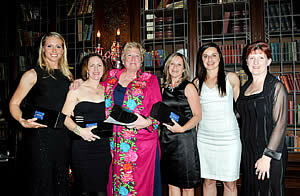 Toronto, Ontario – The final numbers are in, and the inaugural ‘A Royal Canadian Evening’, held November 6 at the historic Casa Loma in the heart of Toronto, proved to be an extremely successful fundraising event, raising more than $20,000 for the Canadian Dressage Athlete Assistance Program (C-DAAP). Founded by Deborah Kinzinger Miculinic, C-DAAP was developed as a means of assisting Canadian dressage athletes at the junior, young rider and high performance levels with the training, competitive and educational expenses incurred during their quest to represent Canada on the world stage. To date, seven high performances athletes – Jacqueline Brooks, Brittany Fraser, Jaimey Irwin, Megan Lane, Karen Pavivic, Belinda Trussell and Chris Von Martels, have received C-DAAP grants totaling more than $130,000, and now have their sights set on the 2015 Pan American Games to be held on home ground in Toronto, ON. In addition, C-DAAP has contributed over $30,000 to various rider support programs. ‘A Royal Canadian Evening’ brought friends of Canadian dressage together, with all of the net proceeds going to support C-DAAP. Canadian astronaut Commander Chris Hadfield entertained the audience as the keynote speaker at the black-tie affair, auctioning off the Canadian-made Norman guitar he played at the end of the evening. The Countess Bathurst was the Patron of ‘A Royal Canadian Evening’ while Canadian comedian Neil Aitchison acted as Master of Ceremonies. Butternut Ridge was the presenting sponsor, joined by supporting sponsors Omega Alpha and Groundswell. With a variety of tempting items up for auction, the elegant dark bay filly, Bojidar, donated by Butternut Ridge, attracted the highest bid of the night. A bidding war erupted over a travel package to England that included a one-week stay at The Earl and Countess Bathurst’s estate in the Cotswolds, two nights at the Hampshire Four Seasons Hotel and Equestrian Center, and a $2,000 Air Canada gift voucher to travel in style. Also proving extremely popular was the opportunity to customize a package with six-time Canadian Olympian, Christilot Boylen. As a memento of the experience, Boylen also gifted her 1971 Pan American Games Gold Medal won in Cali, Colombia, to the winning bidder. Guests at ‘A Royal Canadian Evening’ included Megan Lane, Belinda Trussell, Desi Dillingham, Victoria Winter, Eva Havaris and Christine Peters. “I am so appreciative of the support from those who purchased tickets and/or auction items, and I am very grateful to our supporting sponsors, Omega Alpha and Groundswell, who made the evening possible,” said Kinzinger Miculinic. “Raising funds for dressage is certainly not easy, and it requires the support of our entire community if we are to be able to provide funds to our riders when they need it most. The Canadian Dressage Athlete Assistance Program (C-DAAP) is a donor-driven program dedicated to supporting and advancing Canada’s junior, young rider and high performance riders. The program solicits contributions and awards grants to eligible Canadian dressage riders. C-DAAP’s goal is to provide supplemental funding to Canadian dressage athletes to off-set training, competitive and educational expenses incurred during their quest for excellence, thus creating a bridge to high level national and international competition. For more information, please visit www.cdaap.ca. Photo by Susan Stickle, www.susanjstickle.com. Aachen, Germany – Megan Lane of Loretto, ON enjoyed an impressive debut at the CHIO Aachen, considered by many to be the world’s most prestigious annual equestrian event, held from July 15-20 in Aachen, Germany. Riding Caravella, her own 13-year-old Canadian-bred Dutch Warmblood mare, Lane placed ninth in the CDI4* division after achieving a score of 70.460% in the Grand Prix. She went on to contest the Grand Prix Special, where a second strong performance earned her a score of 70.235% for sixth place. Only 23 years of age, Lane is one of five Canadian dressage riders who each received a $20,000 grant from the Canadian Dressage Athlete Assistance Program (C-DAAP) in support of their 2014 international competition goals. 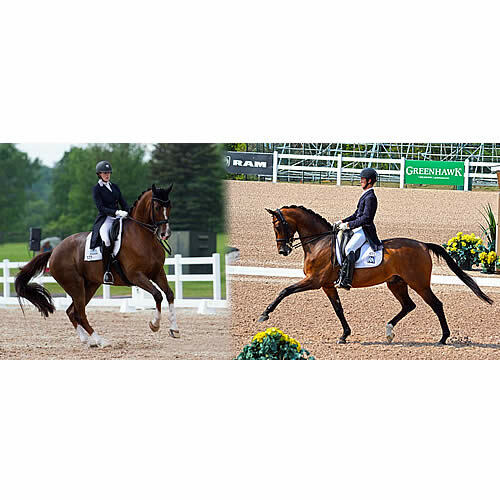 Lane and Caravella have been named to the Canadian Dressage Team that will compete at the 2014 Alltech FEI World Equestrian Games (WEG) in Normandy, France, in August. It will mark Lane’s major games debut but it is not her first international appearance; previously, she and Caravella represented Canada on teams at the North American Junior and Young Riders’ Championships, earning medals several times over. Lane will compete at CDI3* Verden, Germany from August 6-10 as a final preparation for WEG, which acts as the world championships for equestrian sport. The four other Canadian athletes to receive C-DAAP High Performance European Training and Competition Grants are: Brittany Fraser of New Glasgow, NS and All In, her nine-year-old Dutch Warmblood gelding; Karen Pavicic of Surrey, BC and Don Daiquiri, a 12-year-old Oldenburg gelding owned by Pavicic and Jayne Essig; Belinda Trussell of Stouffville, ON and Anton, a 14-year-old German-bred gelding owned by Robyn Eames; and Chris Von Martels of Ridgetown, ON and Zilverstar, his 10-year-old Dutch Warmblood gelding. Dinner was delivered to guests by pony-drawn carriage at the ‘Dressage Soiree’ fundraising event. Photo by Mary White, Lone Oak Equine Photography. Held at the Royal Canadian Riding Academy in Cedar Valley, ON, the venue was transformed through a country picnic theme expressed in the décor and menu. Guests were treated to dinner ringside during the Grand Prix Special and Grand Prix Freestyle competitions, showcasing dressage sport at its highest level. Guests were seated so close to the action that their dinner was delivered via ‘pony express’, with a pony-drawn carriage distributing meals to the box seats. Guests were served fruit and cheese from Vince’s Market, ribs provided by Cobblestone Farms, and mashed potatoes and salads from Reser’s Fine Foods. As for the competition, Megan Lane of Loretto, ON wowed the audience by winning the Grand Prix Special with a score of 72.98% riding Caravella while Diane Creech of Caistor Centre, ON and the handsome chestnut Devon L performed their musical freestyle routine to win the Grand Prix Freestyle with a score of 72.05%. In addition to their share of the prize money, the top-placing riders were invited to select items from the Butternut Ridge Prize Table. Prizes included Go-Pro video cameras, a 50″ Samsung Smart TV, a Nespresso coffee machine, a Breville kitchen mixer, and many more fabulous prizes. Founded by Deborah Kinzinger, the Canadian Dressage Athlete Assistance Program (C-DAAP) is an Equine Canada/Dressage Canada fundraising program developed to support Canadian high performance riders at all levels – senior, young rider, and junior. Last year, grants of $15,000 each were provided to Jacqueline Brooks and Jaimey Irwin to attend the 2013 World Cup Final. This year, the Dressage Canada High Performance Committee awarded five C-DAAP grants of $20,000 each to Brittany Fraser, Megan Lane, Karen Pavicic, Belinda Trussell and Chris von Martels to help off-set the costs of training and competing in Europe. Grants for junior and young riders are also expected to be awarded this year, helping to develop the pipeline of up-and-coming athletes. The Canadian Dressage Athlete Assistance Program (C-DAAP) is a donor-driven program dedicated to supporting and advancing Canada’s junior, young rider and high performance riders. The program solicits contributions and will award grants to eligible Canadian dressage riders. C-DAAP’s goal is to provide supplemental funding to Canadian dressage athletes to off-set training, competitive and educational expenses incurred during their quest for excellence, thus creating a bridge to high level national and international competition.